Will SXSW 2008 Be the Death of Twitter? As digital media professionals from across the country and around the globe pack their bags for the annual trek to Austin, one question is emerging that will likely dominate the conversation at this year’s SXSW festival — can Twitter survive it’s own success? Last year Twitter emerged as the runaway hit at an annual event that’s been described as spring break for geeks. At the time I speculated that something better would almost certainly come along within the next year. Surprisingly, a year later Twitter is still going strong. I say surprising, because Twitter is such a simple concept that it should have been easily usurped by something better. In the past year Twitter has successfully resisted insurgencies from rival applications, including Jaiku, and to a lesser degree Pownce (which still lacks basic SMS support). That Twitter has succeeded where its competitors have failed is all the more amazing considering the downtime and performance issues the application has suffered. 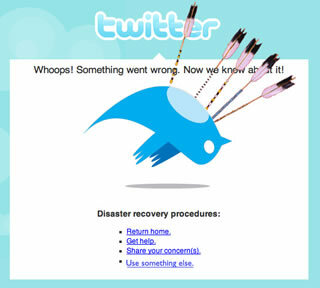 Twitter’s performance problems have been blamed all manner of causes, including the service’s hosting environment, phenomenal user growth, the Rails platform, and the underlying application architecture. Regardless of the cause, the Twitter faithful continue to use the application, although they grumble mightily when the service fails. Twitter’s open API and the emergence of all sorts of Twitter powered applications has helped fuel the site’s popularity, while at the same time contributing to the performance problems that make Twitter so unreliable. Twitter’s success has been an inspiration to every upstart web application developer at SXSW, while Twitter’s problems have been a cautionary tale reaffirming ever application developer’s worst nightmares. Every year one or two dominant themes emerge at SXSW. This year I expect scalability to be one of the main topics of the week — at least among the more technically inclined attendees. Having said all of this, I have to add that even if the worst happens and Twitter suffers multiple long outages during SXSW, I expect that Twitter will continue to maintain a strong hold over its users — at least until a more reliable replacement comes along. The real threat is that Twitter’s life will be cut short by a rival application that finally overcomes Twitter’s scalability limitations. When the attendees at this year’s conference aren’t Twittering, you can bet they’ll be planning their own Twitter compatible replacement. SXSW is populated by just the sort of people who are ready, willing, and able to build a better application. I heard on TWiT that Twitter (no relation) was awesome and addictive. I signed up. I searched for interesting and useful content and interesting people and conversations. I found plenty of random spam, and a lot of postings in various European languages. I found that I eventually regretted having spent 15 minutes learning that 140 characters, in any combination, is really not “rich” enough media, even for my tastes. I also learned that I had no desire to meet a completely random sampling of Twitter-literate strangers.